Are you in the market for new A/C servicing equipment? Whether you run the service department of a dealership, an auto repair shop, or a small-town garage, you know that air conditioning is critically important on those summer days. As one of the world’s leading automotive suppliers, MAHLE has rightfully earned a reputation for manufacturing some of the most innovative solutions for clean air, fuel efficiency, and driving pleasure. They always deliver the highest performance and most dependable equipment for service professionals. Best Buy Auto Equipment is pleased to carry a wide variety of MAHLE AC machines that can help you streamline your A/C service offering in the long run. We offer a number of ArticPRO refrigerant recovery and handling systems at affordable prices to suit your budget and needs. Our selection of MAHLE AC machines is stocked with plenty of options to choose from. When repairing and performing maintenance on automotive air conditioning systems, that old refrigerant can be recovered for subsequent recycling or reuse. Each refrigerant recovery system we supply is designed to remove refrigerants from cooling equipment and abide by all EPA standards. Every refrigerant recovery system in our selection features an automatic HPS safety shut-off and automatic low-pressure shut-off as well as 1/2 HP compressors that do not require any oil to ensure easy, time-saving, and precise refrigerant recovery. 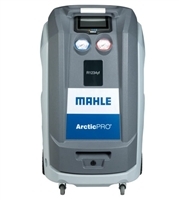 MAHLE AC machines come fully loaded with additional cost-saving features and superior technology. We offer an array of refrigerant handling systems that are super-charged to ensure full recovery and recharge in any climatic condition and guarantee recovery without additional support function. With refrigerant handling systems at every price point, you will have no trouble finding a solution that fits into your budget. Many of the A/C machines we offer qualify for free shipping, and select items even qualify for interest-free financing for up to six months. If you would like to learn more about our no-obligation finance application, please feel free to contact us for additional information or further assistance.